Major Frederick Russell Burnham, D.S.O. Military scout. Friend and admirer of Baden-Powell. 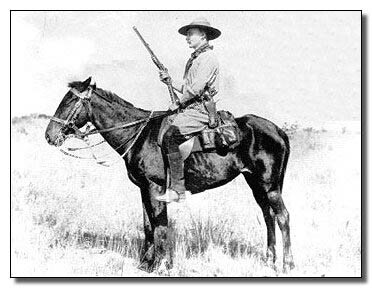 It was on patrol, scouting in the Matopo Hills, that B-P first met Major Frederick Burnham, an American military scout in the employ of Cecil Rhodes and the British South Africa Company. The meeting made a lasting impression on Burnham. Burnham’s description of their scouting days together is one of the earliest pictures of B-P’s military exploits and his thoughts about the future. The ribbon on the right displays the colors of the 13th Hussars–blue and white with officer’s gold trim–on the khaki background of the field uniform then in use by the British Army in India and the African colonies.